Is Steak Good for Losing Weight? 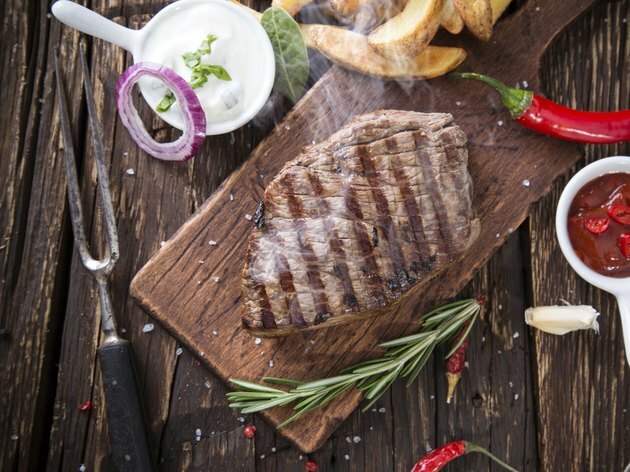 Steak at every meal might be a meat lover's dream, but it isn't the best choice if you're trying to lose weight. It is a good source of protein, which can help you feel full, but some cuts are also very high in fat and calories, which quickly derails your diet. This doesn't mean you can't eat a small portion of steak from time to time while on a diet, just that it shouldn't be one of the main foods you eat. A serving of steak can vary widely in calories, depending on the cut of steak and the size of your portion. When trying to lose weight, choose leaner cuts to limit the number of calories you're consuming, and keep your portion size to a sensible 3 ounces. You need to eat fewer calories than you burn during your daily activities to lose weight. Leaner cuts of meat include flank steak and any cuts with the words "loin" or "round" in their name. A 3-ounce serving of prime rib has 328 calories, but the same amount of bottom round steak has only 190 calories. If you eat a whole bottom round steak -- which is likely to be more than 6 ounces -- you'll be consuming 369 calories out of your daily allotment. The recommended protein intake is between 0.8 and 1.2 grams of protein per pound of body weight. This means if you weigh 150 pounds, you should eat between 120 and 180 grams of protein per day. Following a reduced-calorie diet with a protein content toward the higher end of this range may help you feel fuller and maintain more muscle mass while you lose weight, according to an article published in the "British Journal of Nutrition" in 2012, while eating too little protein may make you more likely to regain any lost weight. A 3-ounce serving of braised bottom round steak provides 28.1 grams of protein, but the fattier prime rib provides only 18.7 grams per 3-ounce serving. Foods that are low in energy density, or calories per gram, help you lose weight because they help you feel full while eating fewer calories. Steak doesn't qualify as a low-energy-density food because these foods contain less than 1.5 calories per gram, and even lower-calorie steak cuts have more calories than this. For example, braised beef bottom round steak has 2.2 calories per gram, and broiled prime rib has about 3.9 calories per gram, making steak a medium-energy-density food. Fruits and vegetables tend to be low in energy density, so filling your plate half full with these foods can help you lose weight while minimizing feelings of hunger. If you want to eat more protein to help you lose weight, red meat isn't the healthiest protein choice. A study published in "PLOS Medicine" in December 2007 found that this type of meat may increase your risk for lung, colon, liver and esophageal cancers. Skinless poultry, seafood and vegetarian protein sources, such as legumes, are healthier choices. Academy of Nutrition and Dietetics: What Are Considered Lean Cuts of Meat?